Ever since adding a bunch of BizTalk stuff to my development machine, I’ve had a (admittedly) small problem with the WCF test client (wcftestclient.exe). 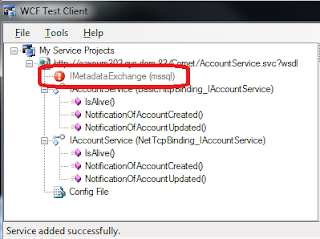 The contract 'IMetadataExchange' in client configuration does not match the name in service contract, or there is no valid method in this contract. 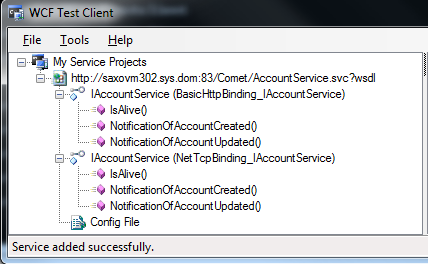 To recover, please manually correct client configuration. Or restore to default configuration. 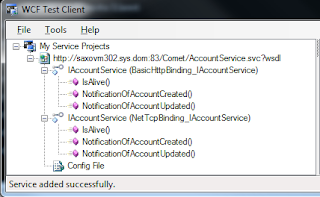 Or check "Always regenerate config when launching services" in the Tools -> Options menu, then refresh the service. Stating both the cause of the problem (installing the BizTalk Services SDK) and (almost) the solution to my problem.